Almost anything can be counterfeited, and virtually everything is. That includes gold. Not just the gold that’s used in jewellery, but gold coins and even gold bars. That might seem unlikely, but it does happen. It’s more common with coins, but there are also recorded instances of faked gold bars being sold to people. There’s very little counterfeiting of gold bullion coins, since there’s not a great deal of profit margin in the activity, and the name of the counterfeiting game is profit. Where fake gold coins can be a problem is in the rare coins market. The value there is in the rarity more than the gold. The gold content of the fake is quite real, but the artistry comes in the ageing of the coin, which can be done so perfectly that only a professional will be able to tell it’s not real. 3-D laser imaging is used to create the die that can be almost impossible to tell from the original. From there, all it takes is the work to make the rare coin look old. It requires an in-depth knowledge of the rare coin market, but lots of people on both sides of the law have that. There’s a lot of money to be made in this field, and since these kinds of coins are becoming more prevalent, a number of collectors are only buying coins that have been inspected and verified by professionals. 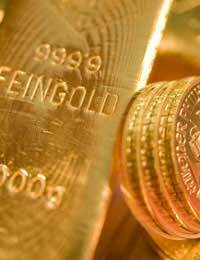 Where gold bars are faked, they tend to be those that are larger than one kilogram. This is mainly because the smaller ones are stamped out and numbered, as well as being sealed. There’s just too much work involved for a relatively small return. In the bigger weights, the bars are poured, not stamped out, and the weight can vary a little. That makes them much easier to fake. One of the most common ways is to put a coating of real gold around lead. Other metals are also used, but because gold is very dense it needs to be a dense metal underneath to give the weight. People say that the general way to test whether something is gold is to bite it. It’s true that gold is a soft metal, and you can make an impact on it with your teeth. There’s a problem with this: if it’s gold, then you’ll make a mark on it and ruin it. If it’s not, you could damage your teeth. Nor does dropping it and hearing it ring to check if it’s gold work properly. Brass makes a ringing sound, too, but gold only does up to 22 karats. The density of gold can be a giveaway with gold bars. Gold is very dense, more so even than lead. The bar might feel heavy, but is it heavy enough? Gold has a density of 19.3 grams per cubic centimetre. Gold will react with nitric acid, where base metals won’t. However, this test isn’t one that’s easily carried out anywhere but in a laboratory. There are also commercial counterfeit detectors, which work on the thickness, diameter and weight of the metal. Ultimately, it’s not that easy to discover whether gold is real or counterfeit. If you’re in doubt, the safest thing is to consult a professional, whether that’s a coin dealer or a bullion dealer. Remember, too, that if a deal seems too good to be true, then it probably is. Is That Real Designer Jewellery? Recognising a Precious Stone: Diamond Or Cubic Zirconium?